We’re looking to overhaul one lucky artist’s home studio featuring awesome new gear from Sterling Audio. Can your home studio use an upgrade? Well, we’ve got just the thing! Our friends at Sterling Audio are gonna hook up one lucky winner with some great new studio products – including microphones, a vocal mic shield, studio monitors and a dedicated headphone amp. The winner will chronicle their behind-the-scenes usage of the new studio gear through video and social media, as they incorporate them into their recording sessions. 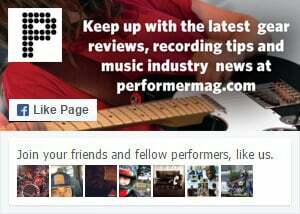 They will also be featured in an upcoming issue of Performer. Cool, huh! Scroll down for more detailed info about each of the new products, and good luck! Entrants must be from the Continental United States. One winner will be selected to receive the Sterling Audio products listed below and we’ll announce the selected studio tester the final week of April 2019. DEADLINE to enter is April 26, 2019. Please note that we will not share, rent or sell your data. Good luck! The Sterling Audio SP150/130 Studio Condenser Microphone Pack is the ultimate solution for recording versatility, ideal for vocals, speech, guitars, drums, and instruments — complete with full frequency range and extreme volume handling. The side-address SP150 delivers articulate and detailed vocal, instrument and speech recording, while the end-address SP130 instrument mic captures fast transients with outstanding clarity and the focused isolation of a cardioid pickup pattern. Includes HM-2 mic stand mount, HM-3 mic clip and custom carry case. The Sterling Audio ST131 Studio Instrument Condenser Microphone is the ideal choice when looking to capture fast transients and subtle sonic detail with outstanding clarity. Its full frequency range and extreme volume handling offers wide studio versatility, while its hyper-cardioid pattern helps isolate sound sources. The ST131 is optimized to record the character and detail of acoustic guitars, pianos, percussion, drum overheads and more. Comes complete with mic clip and zippered carry case that complement the ST131’s rugged construction and head-turning style. The VMS features deep foam ribs that absorb high and mid frequency energy, while the perforations of the back shield diffuse low frequency energy as it passes through, rather than reflecting back into the microphone. All you get is the full rich sound of your vocals recorded directly from the sound path. Sterling’s Vocal Microphone shield is versatile; just remove the adjustable mounting bracket and set it up for close miking your favorite guitar amplifier. The large surface area with absorption and diffusion on 3 sides controls ambient space around the microphone so you can get a clean, true isolation from your instrument without bleeding into the ambient room mics or any other channel that happens to be nearby. For smaller studios or project studios where space is at a premium, the Sterling MX5 Powered Studio Monitor delivers top-class audio quality and features in a smaller footprint. Each bi-amplified monitor is built for optimal frequency dispersion, giving you clear, articulate sound even when listening off-axis. A 1” silk dome tweeter powered by neodymium magnets give the MX5 a naturally smooth frequency response, while an acoustically engineered 5” low-frequency driver cone offers superior damping to minimize sonic artifacts. The MX5 achieves best-in-class efficiency and ultra-low distortion even when mixing challenging content. With a sophisticated dual matte black finish and backlit Sterling logo, the MX5 Black Series will look as good as they sound in your studio environment. The Sterling SHA4 Headphone Amplifier is ideal for recordists and recording engineers who need a quality amplifier with an assortment of input/output configurations and versatile monitoring options. The flexible dual-source audio inputs provide two discrete headphone mixes per channel, which can be changed at the flip of a switch. The stereo Link function allows for daisy chaining multiple SHA4 headphone amplifiers for easy scalability as your requirements grow or change. The SHA4 can also be used as a desktop device, or mounted on a mic stand with its integrated mic stand adapter. Its robust design and rubberized side caps provide superior durability, ensuring dependable audio-monitoring service for years to come.